Every Sunday between now and September I will be sitting at desk for eight and a half hours. Eight and a half hours of potential writing time if I can multi-task. A dream come true for a lot of writers even if the price is talking to tourists; people who’s IQ seems to drop the moment they decide to go on vacation. But, I have access to a computer, the internet and a boss who lets me write so long as I get my work done. One of the things that I do to keep myself from going crazy is watch TV shoes on Hulu. It keeps the stillness of the office from overwhelming me. 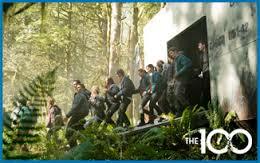 At the moment, I am watching the 100, a new series on the CW which is gaining in popularity. It seems that Americans are obsessed with dystopian futures. Perhaps it is our discontentment with the current state of world affairs. Or maybe we have just had enough of happily ever after and need something with some grit. In the 100, the nuclear Armageddon that sent school children around the world under the desks for thirty years as finally taken place and the only surviving human are those living on a space station called the Ark. Only nine-seven years in the future, the Ark’s systems are failing and life-support can no long support everyone on the station. People are already beginning to suffer the effects of oxygen deprivation. So, 100 juvenile prisoners are exiled to the surface to see if it is safe. It is a well written drama with expert twists making it great food for inspiration. I can see the classic archetypal characters running everywhere throughout the show. It gives me ideas for how to make my own characters more complex. This afternoon, I hope to brainstorm some ideas for a short story to be submitted to a horror anthology at the end of May. 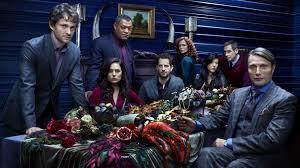 Maybe I will watch some Hannibal after the next episode of the 100. What inspires your writing or gets your creative juices following?